It’s virtually impossible to consider any business, however large or small, being able to operate without an effective and efficient telecommunications system, and whatever the size of your business, the benefits of having such a system are immeasurable. Firstly, when it comes to running a business, you need to know that you can stay in constant contact with your customers, clients, suppliers and partners – not to mention your staff and any contractors you might employ. Without effective and reliable business telecoms this is simply unthinkable – and the system works both ways. Without said telecoms, how can those people, groups or individuals possible contact you? Now that we’ve dealt with the benefits of having a system of some description, it’s time to consider why such a system needs to be designed with a business in mind. For a customer, there’s nothing more irritating than trying to contact a business you need to speak to only to find an engaged tone. At least with an automated answering service, the customer knows that they have some chance of being able to speak to the business in question, whilst an engaged tone simply means that they have to hang up and try again. The benefit for both you and your customers with a business line is that you can have more than one line on the same telephone number – enabling you to answer and keep up to ten callers at a time. Although some at home telephones might have an answering machine and even a mute button, many don’t have the features which would add to your professionalism. Normally business telephones will come with functions such as hold and call transfer. Taking advantage of modern communications such as Skype could really revolutionize the way you meet with clients and customers. The key with both of the above benefits is that they add to the professionalism that you and your business are able to demonstrate, and that’s why so many businesses, both large and small, choose business telephone systems as a key way to manage their telecoms. Or better yet they sign up for their own 800 business number. A further benefit is the support which can be given in the event of something going wrong. At one point or another, we’ve all had a phone line break down. As a home owner it’s frustrating enough however, as a business owner it could cost you money. Using a business telephone though means having customer support as and when things go wrong – with the aim of getting you back online as soon as possible. 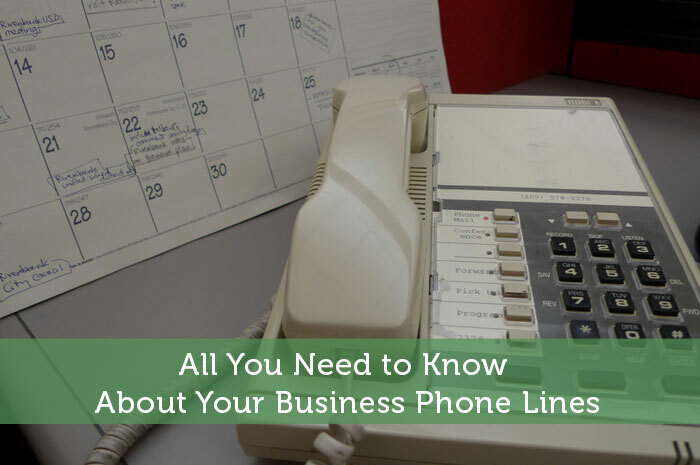 Having more than 1 line is a need if you have a busy business. I always hate having to call back numerous times because the line is busy. I’d rather be put on hold! For sure…I could see companies outright losing business if they don’t have enough phone lines. If a customer can’t get through at all, eventually some will call a competitor. The trick is determining when it is necessary to expand to more lines. I used a virtual assistant to handle my phone service issues. That way, even though my business was “tiny” I sounded like a big business whenever anyone called. It wasn’t a huge expense, either. Sounds like a smart route to go. Making your business sound big usually works in your favor. With the technology available today, it’s probably pretty easy to have someone answer your calls from anywhere in the world. When I was running my ecommerce business, I just employed a virtual service that would ring my home phone. It was professionally recorded and allowed anyone to pick which “department” they wanted to speak to. When I answered my phone, it would tell me which department, so I would answer the phone appropriately. It was awesome, but cost me monthly. I would gladly pay the fee. That’s a nice touch to have multiple departments. It would make your business sound a lot more professional. I might consider that kind of setup down the road if I ever need to take a lot of phone calls. It’s crazy the hassle a telecoms failure can cause, for most businesses telephone support is still the primary form of contact for their customers. Most people want instant answers to questions or complaints without having to wait around for an email. I hope to never be so reliant on a phone system. E-mail contact is just so much more convenient. Of course a business can usually only grow so big without using phones a lot. That is unless you’re a massive company like Google. Then you can avoid having customers contact you at all costs. I have 2 companies and each has its own local number, while my accounting business has a toll free option as well. And they include all of the features one could possible need, vm, vm alerts via email, call waiting, caller id, etc. The best part is that it’s VoIp and doesn’t cost me much at all. Plus, I don’t have to invest ridiculous amounts of money in “telephone systems” since it works with a regular old phone. That really is the future of phone systems. I think more and more companies will be going with a voip based system. Of course you need a very reliable internet connection, otherwise it probably wouldn’t be worth it. When I worked on the farm, my boss continually had problems with his phone service. There was basically no cell service in the area, so he had to stick with a land line. Only problem was the wiring dated back to the depression and his service would cut out whenever there was a heavy rain. By the time a technician got out there to check, the wiring would dry out and they couldn’t find any problem! Sounds like a big headache. Hopefully he didn’t have to use his phone all that much to run his business. I don’t know how a technician could even safely check wiring that wasn’t holding up against heavy rain. There are services, commonly called “Centrex” that give you the capabilities of a corporate PBX with having to buy the expensive equipment. I haven’t been on the Telecom side of IT for a while so am not currently up to date on similar services provided over VOIP. I should brush up on that and post something on it in the future! I’m sure VOIP based services are making things like Centrex less appealing. If everything is going through a computer, you really should have a lot more capabilities. Small businesses should be looking into VOIP as a real possibility if they don’t have a proper phone system setup yet. I run a non-profit organization out of my home. I never thought of doing any of this, but how thought-provoking! Thanks so much for the post! It’s worth looking into anyway. It would be nice to have a good system setup to know when calls are personal or related to your organization. I hate calling and getting the canned message about pressing option 1, then 2, then 322. I would much rather have a real person answer the phone, preferable one who speaks clearly and professionally. A busy signal should never be an option, even if you have to have several lines. Having a live operator is definitely preferable, but not necessarily within the budget of a new company. So the automated system may be the answer while they are still in the early growth stage. I agree that anything is better than that dreaded busy signal. At my workplace they are moving away from traditional desk phones and giving us all mobile smart phones. I secretly believe this is so that they can get us checking and replying to emails at all hours of the night. Obviously the main business still has a land line to call that goes to a reception desk, but soon I think it will be the only one left. I think it’s a smart move. Yes it does keep employees available at extended hours, but a lot probably feel that it’s a bonus to get a smart phone out of the deal. My boss also bought me a smart phone, but honestly I haven’t had much use for it connected with my job yet. I always prefer being able to talk to a person on the phone instead of a machine. I would actually take an awful operator over an efficient automated service. I wonder how many people are in the same boat. I do get pretty frustrated over those automated systems, but a lousy operator could be just as frustrating.